About Innovative Ultrasound Imaging, Inc. The Innovative Ultrasound Imaging, Inc. Difference. Innovative Ultrasound Imaging, Inc. offers the expertise and experience nationally as registered ultrasound technologists with subspecialty training. Innovative Ultrasound Imaging, Inc. has services available at twelve diagnostic centers. They are conveniently located in Southern California, Arizona, and Texas. Since establishing ourselves in Southern California, we have worked hard to expand the availability of exceptional radiology services for our patients and strive to develop strong working relationships with the local referring physician community. Innovative Ultrasound Imaging, Inc. is committed to maintaining high standards in customer service and investing in new medical imaging technologies to ensure we can continue to meet the imaging needs of patients from all of our facilities. The Innovative Ultrasound Imaging Mission. Our mission at Innovative Ultrasound Imaging, Inc.is to provide exceptional, high-quality radiology services that help physicians improve health outcomes for our patients. We understand that compassion for patients, strong working relationships with referring physicians and a positive work environment are essential to our success. Innovative Ultrasound Imaging’s mission is to provide unsurpassed patient care, the most advanced diagnostic imaging technology, and the highest standards of quality. We are dedicated to quality, efficiency and patient comfort. We bring a personal touch to technical imaging procedures, putting patients at ease during their tests while providing accurate and comprehensive diagnostic information. Our mission at Innovative Ultrasound Imaging provides exceptional, high-quality radiology services that help physicians improve health outcomes for our patients. We understand that compassion for patients, strong working relationships with referring physicians and a positive work environment are essential to our success. We do understand that in today’s busy world, occasionally situations come up that are beyond your control. In those instances, we do request you extend us the courtesy of a 24-hour notice. This courtesy allows us to continue to operate efficiently and use the time that was reserved for you to help other patients in need. Our facilities are providers for numerous insurance plans and our office staff can help you determine if we are designated by your plan. However, in order to maximize your health care benefits, you will need to contact your plan directly. We accept Worker’s Compensation and Medicare claims. You can contact our billing department directly by calling (949) 313-7737. You can get information about insurance authorization, status or billing questions at this number. We can assist you quickly should you have questions regarding your account. If you have any questions or need further clarification pertaining to our practice philosophy or our policies, please do not hesitate to contact our office for assistance. In a sincere effort to maintain patient satisfaction while honoring the need to maximize effectiveness and efficiency of our work processes, we have implemented procedures which we hope will let us provide you with the best quality medical care possible. The Health Information Portability and Accountability Act (HIPAA) restricts us from releasing any information without your written permission. Your medical records are strictly confidential. At Innovative Ultrasound Imaging, Inc, patients living throughout the United States have access to a team of professionals with an unparalleled core of education, training, and skill. With our state-of-the-art technology and commitment to remain on the cutting edge of diagnostic imaging is what defines this practice. The technician team at Innovative Ultrasound Imaging, Inc, brings a broad range of skills to the facility. They provide services and care in a welcoming, comfortable environment where technological innovation is an integral part of the practice of imaging. A highly individualized approach ensures that patients are always treated as our number one priority. Innovative Ultrasound Imaging, Inc, would not be complete without the work performed by a fantastic paraprofessional and support team. From the moment a patient walks through the door to the time they leave our office, our team takes the time to make sure that every person in our care feels welcomed, supported, and valued. That dedication to service is why so many turn to Innovative Ultrasound Imaging, Inc. for comprehensive ultrasound needs. Since establishing ourselves in Southern California, we have worked hard to expand the availability of exceptional radiology services for our patients and to develop strong working relationships with the local referring physician community. Innovative Ultrasound Imaging, Inc. is committed to maintaining high standards for customer service and investing in new medical imaging technologies to ensure we can continue to meet the imaging needs of patients all of our facilities. 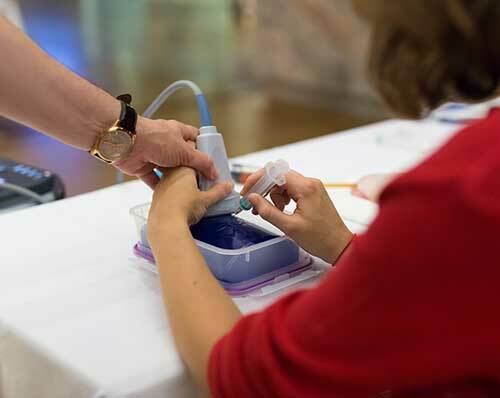 IUI, INC. offers ultrasound education when, where, and how you want it. From on-site programs and workshops, can get you from “zero to scan” with confidence. Whether novice or expert in your use of point-of-care ultrasound, you will find our educational offerings go far beyond understanding ultrasound – they are designed to improve your knowledge of today’s ultrasound best practices. Musculoskeletal Ultrasound is a cutting edge procedure currently being utilized at a number of centers for both the diagnosis and treatment of musculoskeletal disorders. Specifically, musculoskeletal ultrasound can be used for rapid diagnosis and grading of injuries and for the guidance of injections. Our course will introduce the participant to the utilization of musculoskeletal ultrasound in an office orthopedic practice by reviewing the physics of ultrasound, the specifics of the machine, common protocols used for diagnosis of common pathologies, and technique for ultrasound guided injections. Rheumatologists, Orthopedics, Anesthesiologists, Sports Medicine Physicians, Pain Management Physicians, Radiologists, and Sonographers. What is the value of onsite training? Physicians continue to make revenue on-site when not having to travel to be trained. More staff can be trained at no additional cost. Doctors learn imaging and guided injections better on their “home turf” and their own patients. Cadaver labs are expensive and DO NOT translate into a useable/reproducible skills. Ultrasound Guided procedures are SAFE and efficient. IUI, Inc. teaches the “mechanics” of guided procedures. IUI, Inc. offers Procedure Days. We provide the ultrasound system for imaging, diagnosis, and real-time guidance during treatment. What is the ultrasound business plan for physicians? Musculoskeletal ultrasound has greatly expanded the clinical reach of physicians by bringing accurate and rapidly accessible diagnostic and interventional technology into an office setting. Technology that was once limited to large medical groups or hospitals is now financially feasible for physicians in solo practice. As the modern healthcare economy evolves, physicians need to be aware of the financial implications of bringing any new piece of technology into a practice. This template, developed by the IUI, Inc., is designed to help physicians who are considering adding ultrasound to their practices to do so in an organized, comprehensive fashion.